We get a lot of lightning storms. This time of year, we have them almost every day! Our study of Benjamin Franklin coincided nicely with the weather. Last night, the bad weather rolled in just as the sun was setting. It was overwhelming. Soon after the evening meal, the inside of our home suddenly turned a brilliant golden pink. We ran outside to see what was going on! 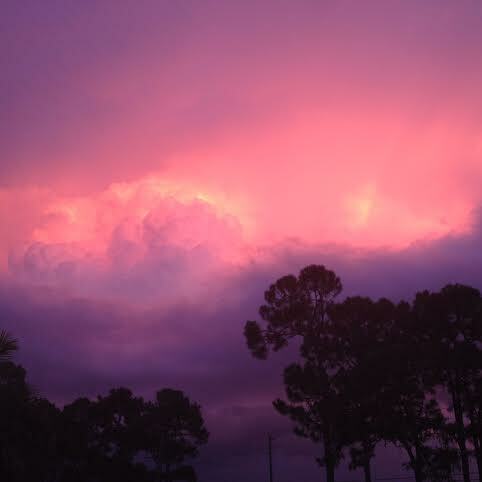 We were greeted by brilliant colors, the rumble of thunder and powerful lightning bolts transecting the sky’s rosy palette. A great way to end a week of lightning watch. Thanks, God! 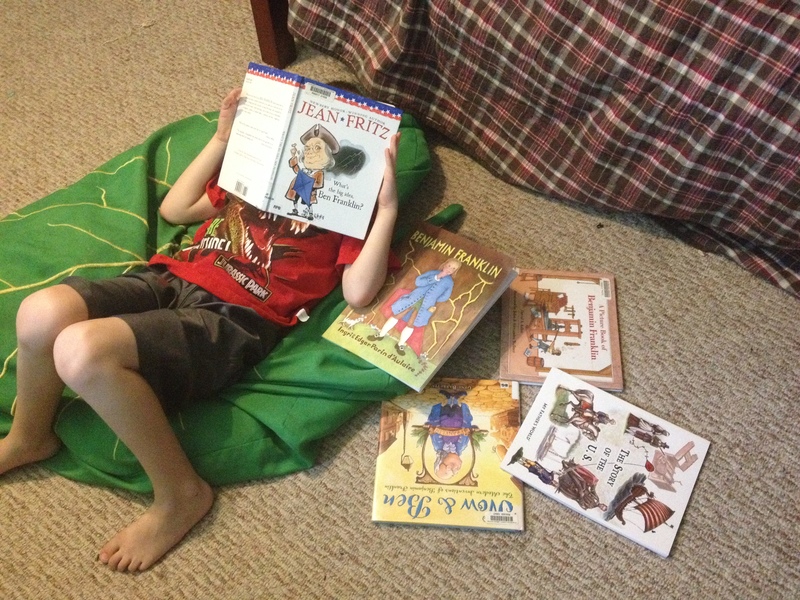 If you’ve been following our blog, you know by now that I am a bit of a book junkie. I hyper focus on books all. the. time. So I am taking a page out of Ben Franklin’s personal book of improvements and finding ways to improve the way I do laundry homeschool with books. Book overload is not a good thing. I am learning to cut back on book volume and instead of grabbing copious amounts of literature repeating the same information ad nauseaum, I am choosing a few solid books that are well written and beautifully illustrated. I am trying to make sure that our book basket has variety and sustains high interest levels. Do I really need 6 books on Benjamin Franklin that all present the same biographical material? No. For example, we picked up “A Picture Book of Benjamin Franklin” by John Alder at our local library last week. This book is fine but not necessary for our week because it parrots back all the information we received through other sources. We ended up slipping that particular book, along with a few others, back into the library bag. 1. Benjamin Franklin Young Printer by Augusta Stevenson We read a few chapters from this biography every night before bedtime. The boys loved hearing stories about Benjamin Franklin as a child. In fact, he simply became “our pal Ben” during these evening readings. How fun to step inside the Franklin family banter! 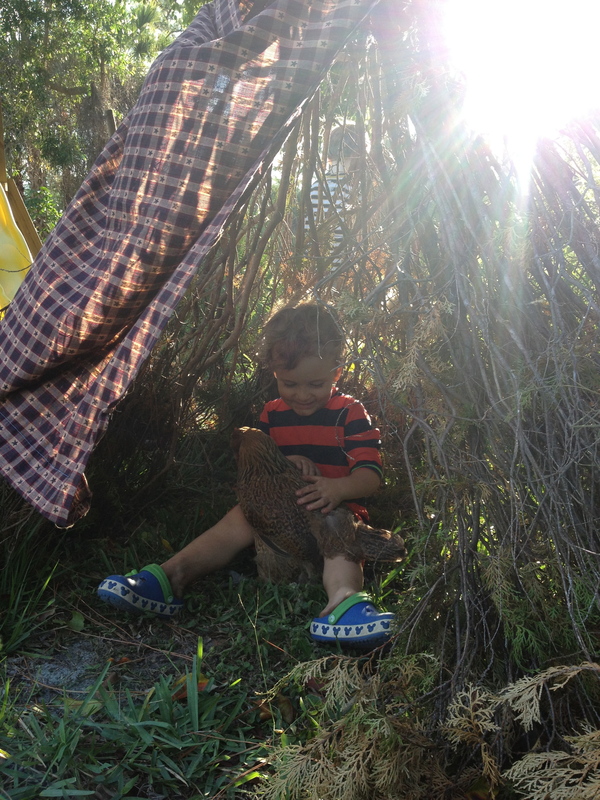 Ben made tough, deliberate decisions even as a child–this captivated my boys. 2. 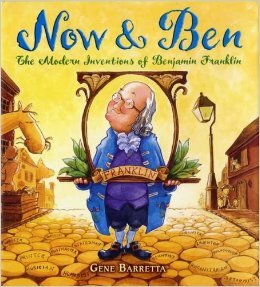 Now and Ben by Gene Barretta We loved this book! Bright and engaging. Parallels our world today with the innovations created by Franklin way back “Ben.” The four year old always came sniffing around when this book was pulled out. 3. The Amazing Life of Benjamin Franklin by James Cross Giblin The pictures alone are enough to draw a crowd. 4. Electric Ben by Robert Byrd My boys read this one back and forth to each other. 5. Ben and Me by Robert Lawson Another great chapter book read. This was our lunchtime book and my children are so hopeful for their own Amos. 6. Whats the Big Idea Ben Franklin? by Jean Fritz My second born has chosen to read this book on his own. He is 3/4 of the way done and I am excited to hear his “report” when it is finished. I love that he is interested enough to pick up a book on his own. 7. 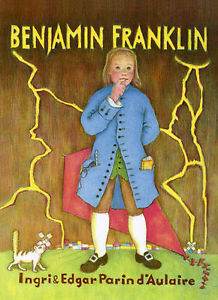 Ben Franklin and the Magic Squares by Frank Murphy Simple enough for my son to read by himself. He came running into my office, waving the book and begging for help so that he could make his own “magic squares.” He made magic squares all week long. 8. 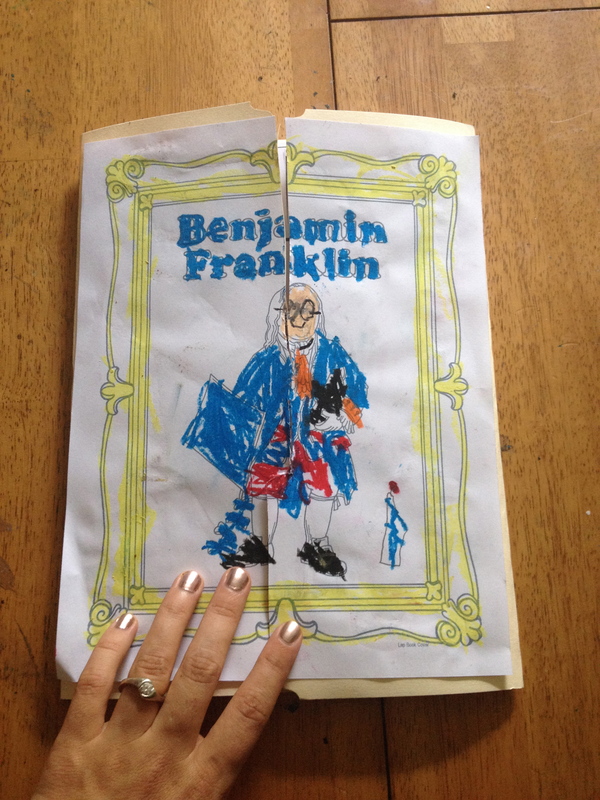 Benjamin Franklin by Indri D’Aulaire Our primary resource (outside of The Story of the U.S.) Beautiful, informative, incredibly engaging. Our Beautiful Feet study has now synced up perfectly with MFW Adventures. We read the D’aulaires book, “Benjamin Franklin” each morning while coloring in the free pages provided by bfbooks.com. One of our favorite chapters in the book, “Ben Franklin, Young Printer,” describes Josiah Franklin’s undercover methods of educating his children. Josiah and Abiah would invite guests over for dinner and through carefully crafted questions, lead the guests through a series of informative conversations that would edify their children and open the world to them while their little feet remained planted under the dinner table. 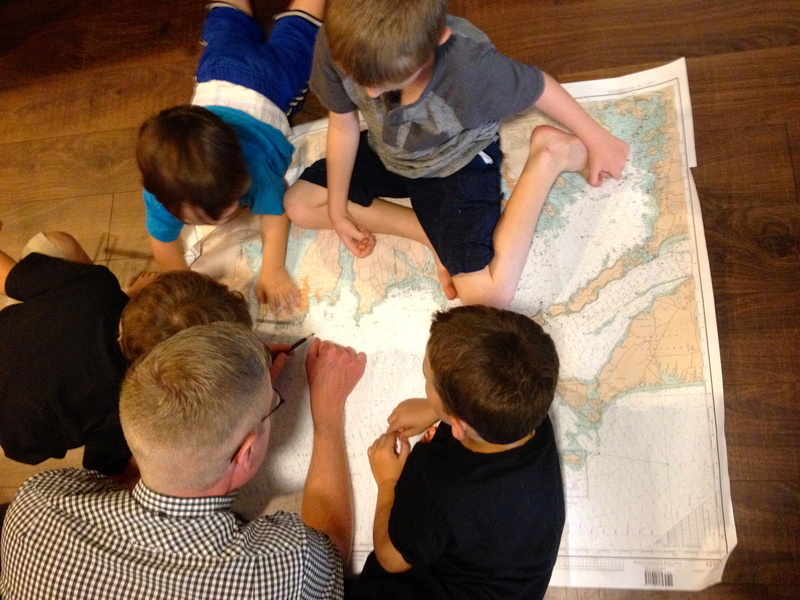 Now on his return trip home, Uncle Captain David stopped by for pizza and brought along his sea charts. 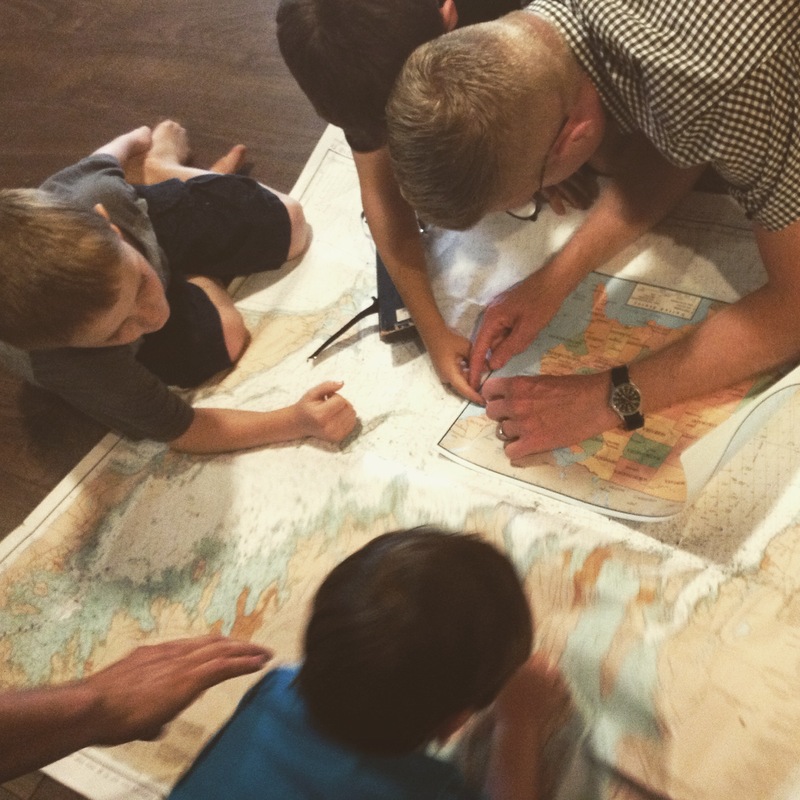 Once the pizza was consumed, the chart was placed on the floor, measuring instruments were brought out and my children were soon learning how to plot courses around buoys, shipwrecks and shallow water. My eldest remarked later, “I think we should do this kind of Franklin School Style more often!” We are so thankful for a wonderful visit with our dear friend and for his willingness to sprawl out on the living room floor and talk to our boys about the things he is learning. Confession: I never really fancied myself a “lap book” kinda gal. They seemed like an inordinate amount of work for Moms with mixed reviews on how much kids actually learned. 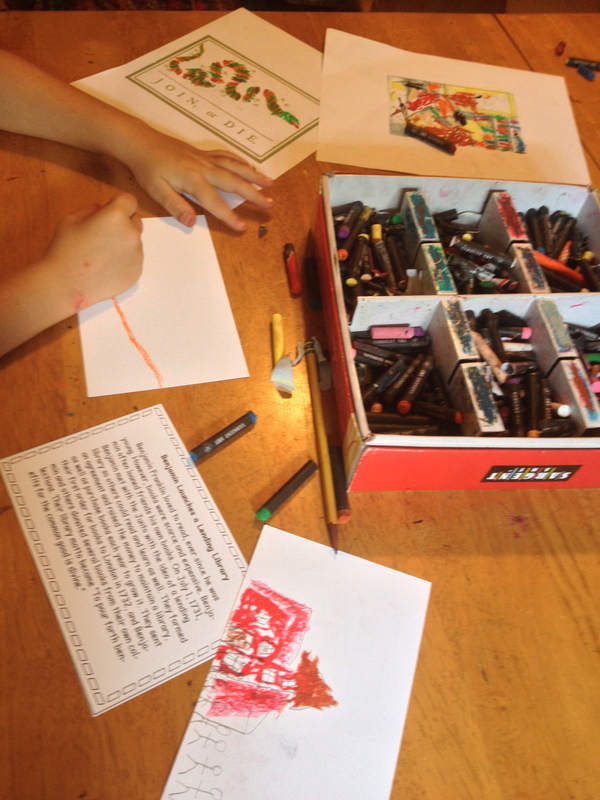 The endless copying, card stock, glue, coloring, assembling–yay! More “Things to Do.” I wondered what percentage of these books were actually put together by children? Also, anything that feeds my Type A personality in a negative way is something I tried to avoid. Lap books just seemed like the homeschool version of crystal meth for my personality. (RUN AWAY!) Anyways, my boys have loved Ben Franklin for many years (devotion to the point of attempting non-sanctioned haircuts in B.Franklin’s money style) and they wanted to do a BIG PROJECT when we reached our pal Ben during Adventures. You know whats coming…. Or rather, THEY finished a lapbook. Yup, we took the plunge. As you can see from the cover page, I was not in charge of coloring. I certainly did the majority of the assembling, but these boys took charge! 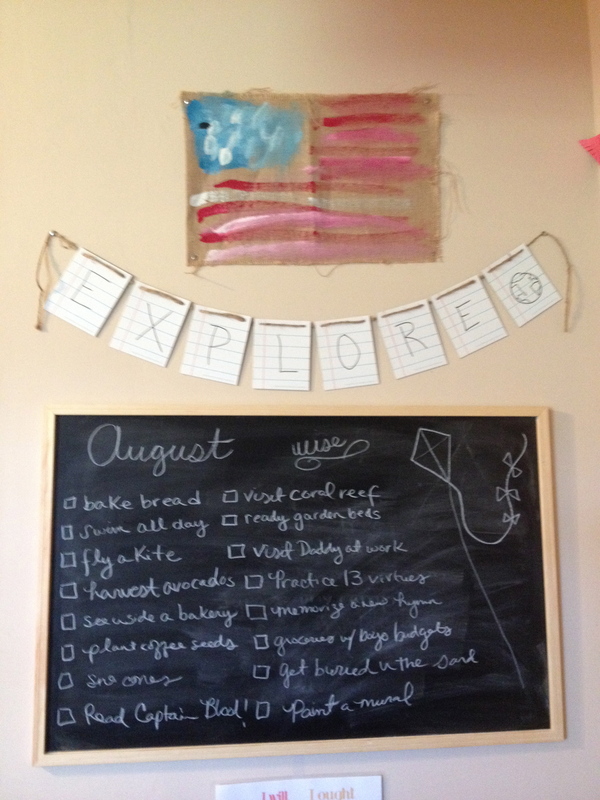 Homeschool in the Woods lap-pak study of Benjamin Franklin was incredibly fun and meaningful. The instructions are clear and precise. 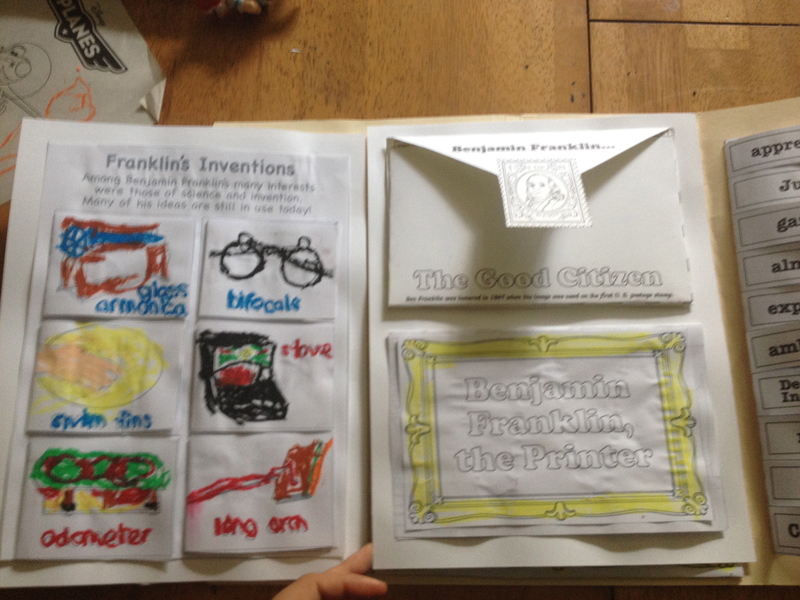 The Benjamin Franklin book we assembled was lovely and I am so thankful that it came with Audio accompaniment. I was able to leave Team A coloring, cutting materials and listening to audio, while Team B and I sorted laundry on the other side of the house. I was a bit worried that we would overload on the Franklin family if we integrated this lap-pak with our MFW study, but it complemented everything quite nicely. The boys were always looking forward to the next small project. If they did not have such a high degree of interest then the lap-pak thing just would not have worked for us. But these boys wanted more! And the lap-pak delivered. Leather apron trades, inventions, timelines, contributions, documents, etc. 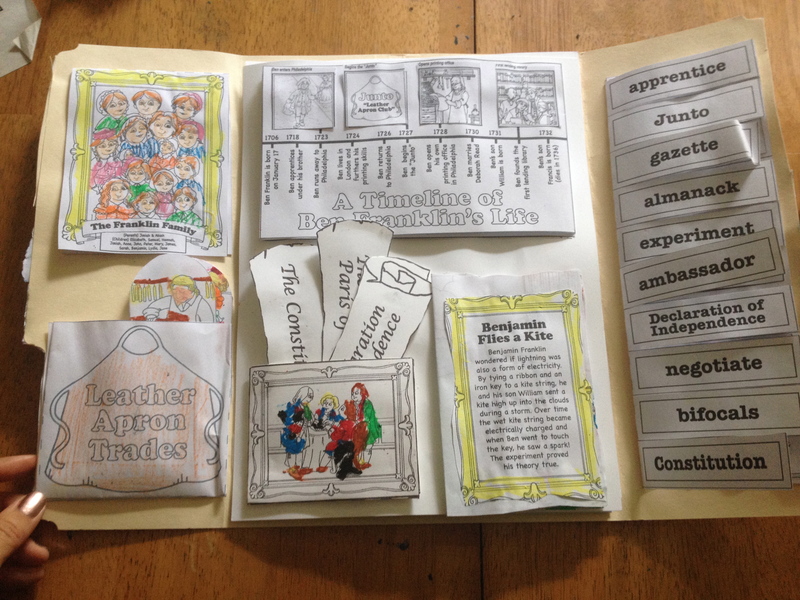 Kudos to Homeschool in the Woods for this thoughtfully prepared material. My eldest loved getting to set the type for his own name with all the letters placed backwards and then seeing it close down on his name with the letters facing the right way. 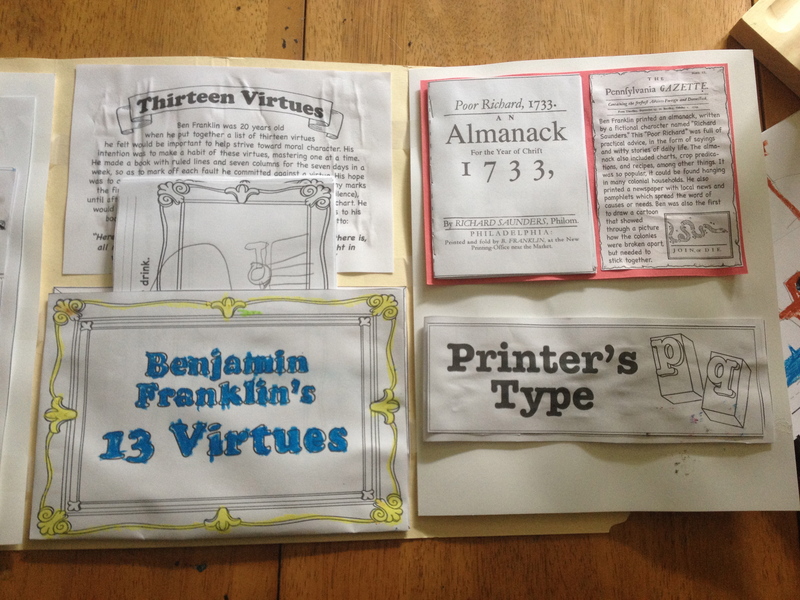 The second-born loved reading about Ben’s inventions and setting up the printing press diorama. Once we assembled the books, I carved 10-15 minutes out my day with each son so they could walk me through their lap-pak. They were so proud of their hard work and eager to relay as much information as they could. If Ben Franklin is just another week for you, proceed as planned. But if your kiddos have a special interest in him and would enjoy something “extra” then I recommend this lap-pak with two hearty thumbs up. (PS. Its geared for grades k-2). The boys learned a lot about the life of Ben Franklin and the importance of following directions. I learned that I am a lap-book “once in awhile” kinda gal and am in no danger whatsoever of becoming addicted. Last but not least, SCIENCE. Lots of Magic Schoolbus over here! Beep, beep! 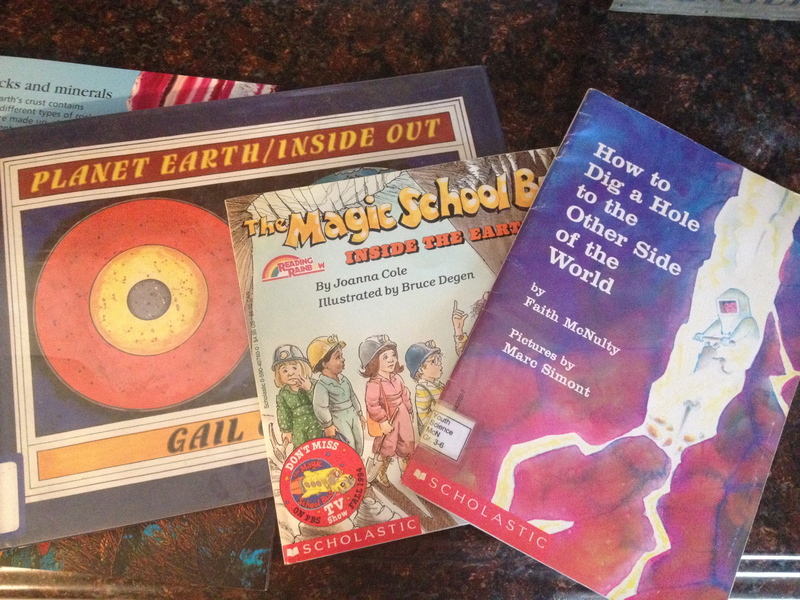 We love reading Faith McNulty’s “How to Dig a Hole to the Other Side of the World.” Its one of our favorite books to read on a fairly regular basis. This year I deliberately included Gail Gibbon’s “Planet Earth/ Inside Out.” This book uses evolution and big bang terms throughout. I walked the boys through the basics of each theory using the book. 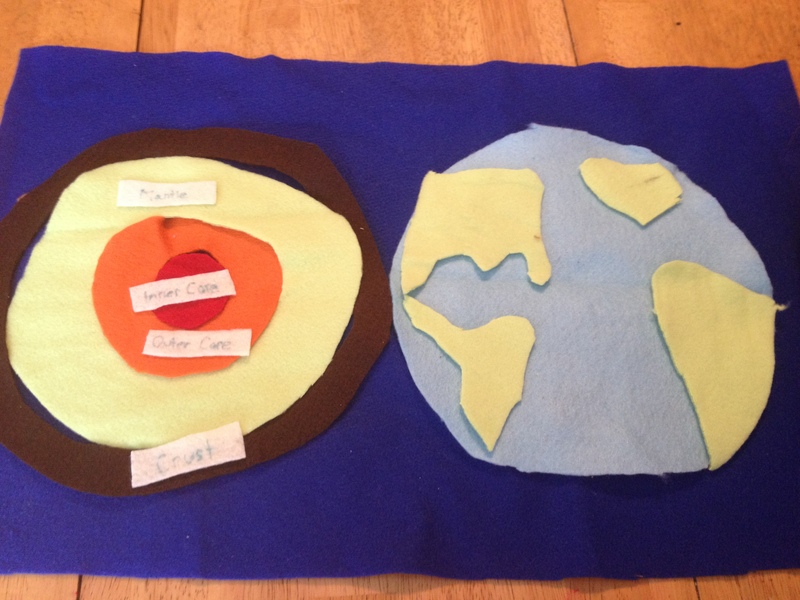 We looked at the creation account (even browsed through our old MFWK Creation books) and then reread “Planet Earth/Inside Out.” Plenty of discussion and great questions. I had to look up a few things and the boys followed along as I researched. The second born was fascinated by Robert Ballard’s current research of the biblical flood’s impact on an ancient shoreline at the bottom of the Black Sea. My eldest wants to research the possibility of pangea’s existence before the flood and the subsequent break up as a result of the flood. I love that he is wondering about that. I am glad that he is sorting through questions about creation and evolution while at home. I went to an evangelical college with a lot of kids that were taught nothing but creation at home and then went through major crises once they arrived in science class and began learning all these theories. I love that homeschooling provides platforms for researching and asking questions together about the beautiful mysteries of the universe our God so lovingly created. How fascinating is our earth? The boys resounding question was “But how do scientists know this FOR SURE?” They are hungry to learn more about the scientific method and the history of science in general. 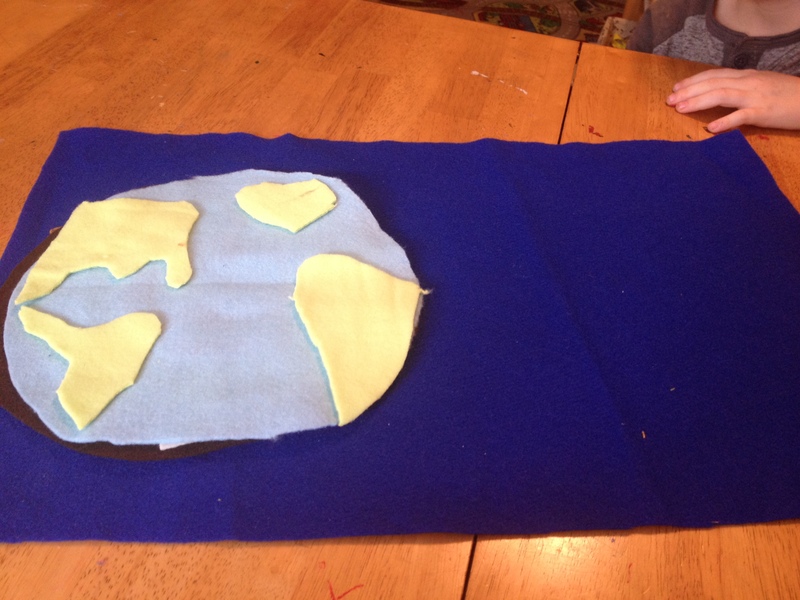 I made a pretty ugly and haphazard basic felt puzzle for the boys to play with. 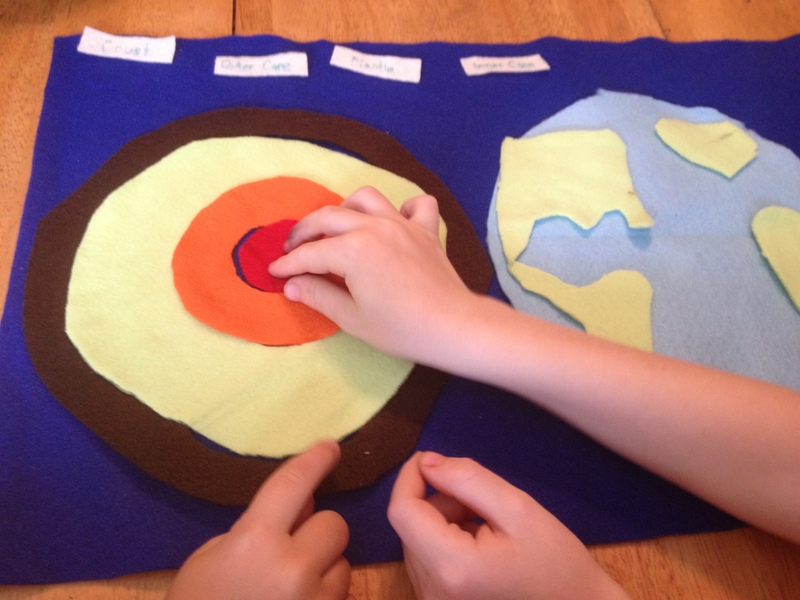 They loved sorting the layers of the earth and labeling the various pieces, all the while asking for MORE INFORMATION! Something tells me that our high school science years will be quite the doozy! 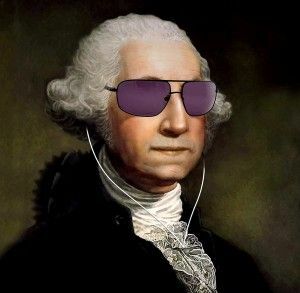 Next week we begin our study of my eldest son’s all time favorite person ever: George Washington! We may be taking more than a week to finish our study, we plan on enjoying it to the fullest!